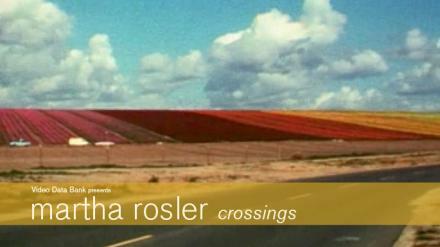 Video Data Bank is proud to present crossings, an extensive collection of video works by Martha Rosler. Spanning five decades, this essential compilation presents Rosler’s unapologetically feminist, politically charged, historically vital, and ever-relevant Super 8 and video artworks. From pivotal early performances such as Semiotics of the Kitchen, to experiments and collaborations like Born to Be Sold: Martha Rosler Reads the Strange Case of Baby $/M, this anthology presents the life and work of one of video art's most influential artists, while simultaneously charting the cultural and technical developments of the video art medium since its inception. Included with the collection is a newly published monograph detailing Rosler’s video works, and with an extensive essay by film and media scholar Nora Alter. A live performance on a public-access cable program in New York deconstructing the messages in Vogue and its advertising. The work looks at the institutional slants of the magazine industry and the fashion industry’s reliance on sweatshops.